I have been cutting out the daily recipe from the i newspaper for some time now and recently there was one for a BLAT (bacon, lettuce, avocado and tomato) with pide bread and aioli. Well, for me, making the bread is a no-brainer and I have made pide before. But since I have recently been making my own aioli, this seemed like too good an opportunity to miss. Okay, so maybe they’re supposed to be round, but decided right at the end to make more, smaller breads and didn’t want to have to wait too long again to prove them. The BLAT post to follow. This entry was posted in Bread and pasta, Uncategorized and tagged flat bread, home baking, pide on April 15, 2017 by julianrawcliffe. Where would I be without recipes from the i? 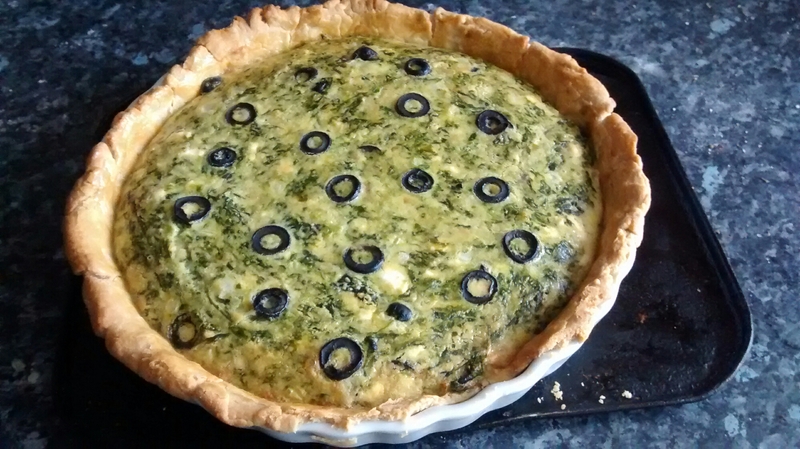 This one is basically a quiche but with olives, feta and spinach. It was also from the founder of River ford Organics, who we used to get a lot of our fruit and veg from. 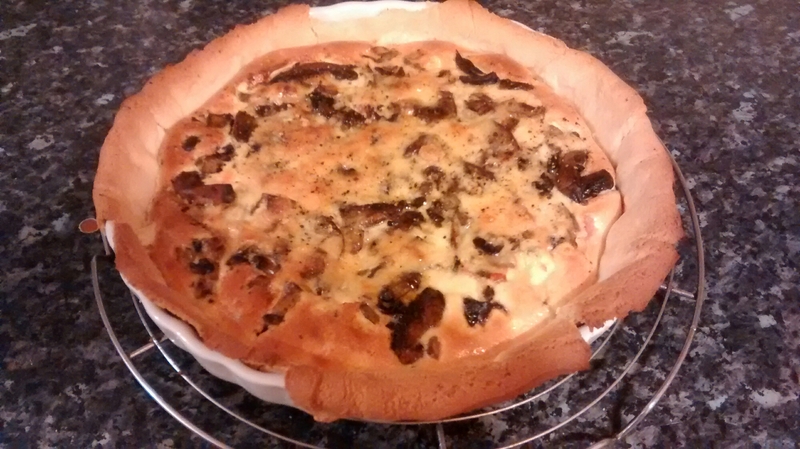 This entry was posted in Bread and pasta and tagged feta and spinach tart, home baking on June 7, 2016 by julianrawcliffe. Another one taken from the i newspaper’s daily recipe. This is made with butter (coconut oil instead), sugar (dates) and with spelt rather than flour. Not quite dairy-free because of the 4 eggs but it’s very simple to make, just bung the ingredients in a bowl, mix and bake for an hour. 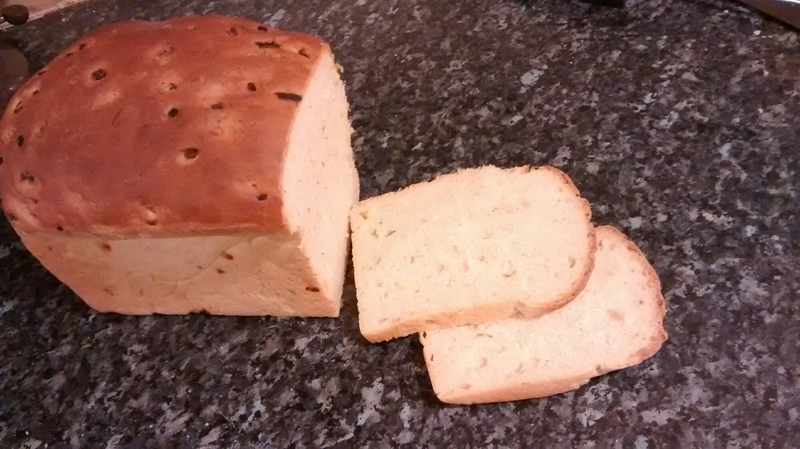 I made a second loaf but forgot the dessicated coconut; it’s definitely better with than without. 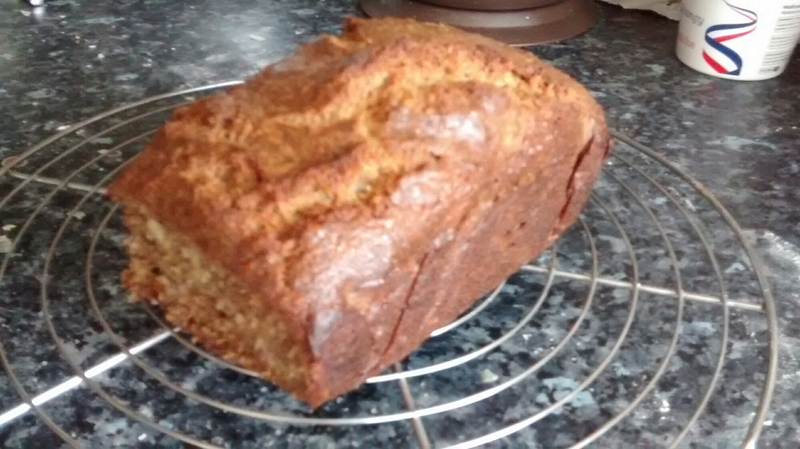 This entry was posted in Bread and pasta and tagged banana and coconut loaf, home baking on June 7, 2016 by julianrawcliffe. While I still haven’t quite got the kouing amann properly sorted yet and I’m not good at pastry, the Swedish dill bread is probably my favourite loaf of all the ones I bake. Cream cheese, onion, egg and fresh dill guarantee a decent rise and an amazingly soft texture. And the taste is phenomenal. Along with some cereal and some fruit, this is pretty much all I need to eat for the week at work. 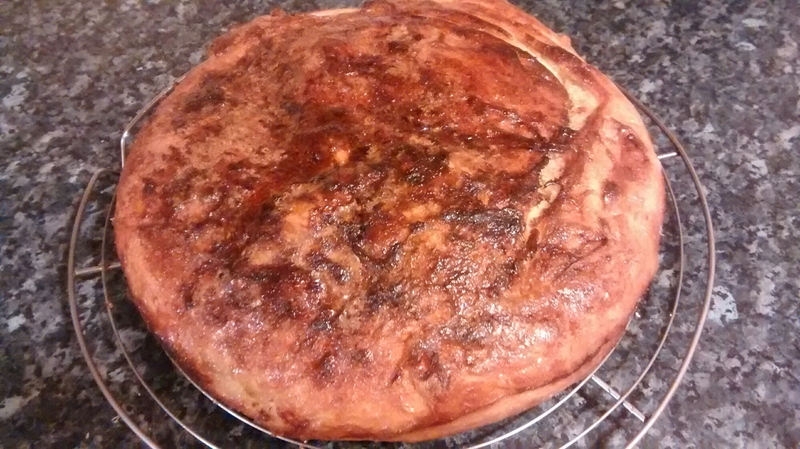 This entry was posted in Bread and pasta and tagged home baking, kouing amann, Sunday baking, Swedish dill bread on December 7, 2015 by julianrawcliffe. The recipe I use for making baguettes (as taken from http://www.dk.com/uk/9781409352723-bread/ – I have avoided a link to Amazon). These get the best shape when cooked on a baguette tray. Put 1lb strong bread flour in a large bowl and make a well in the middle. Put 1/4 pint of warm water in a jug. Add 2 1/2 teaspoons of dried yeast and mix together. Leave for 5 minutes. Stir the yeast mixture and add to the well in the flour. Mix in some of the flour to the yeast to make a batter. Cover and leave for 20 minutes so that the batter starts to froth a bit. Us a wooden spoon to mix in the remaining flour, adding tepid water, one tablespoonful at a time, to the mixture. It can be a bit tricky to judge when the right amount of flour and water has been added, but for me the dough should be easily workable but not feel wet and stick to your hand. With all the flour mixed in, turn the dough out onto a clean (!) work surface and knead for about 10 minutes. Personally, the ideal consistency is when you don’t need any flour on the worktop and the dough doesn’t stick to the worktop but still feels elastic when kneaded; this comes down to experience and simply getting a feel for the dough. Try to avoid the dough being too dry (maybe I’ll post a video that shows a good consistency). After about 10 minutes you should feel a change in the texture of the dough and it starts to stick to the base of your palm as you knead. This is when you know that the kneading is done. Pop the dough in a clean bowl – you can use the one it was mixed in if you managed to get all of the dough out – and cover with a damp tea towel – damp does make a difference – and leave to rise for about 90 minutes, until doubled in size. Knock back, cover with the tea towel and leave to rise for about 45 minutes. Knock back again, cover with the tea towel and leave to rise for about 45 minutes. Yes, this is the 3rd rising. Put two baguette trays on a worktop and lightly cover with flour. Knock back the dough and scrape out onto the lightly floured work surface. Cut the dough into four pieces and roll out each piece into a long sausage shape and pop it onto the baguette tray. Cover with the tea towel and leave to prove for about 45 minutes or so. 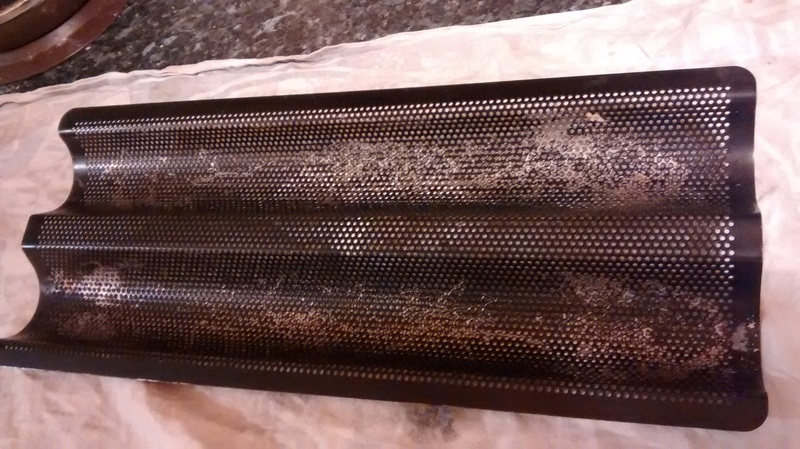 Turn the oven on (gas mark 5) about 15 minutes before the end and put an ovenproof tray in the bottom on the oven and fill with water. Cut 4 slashes across each baguette with a sharp knife and put both tray in the oven. In my case, this has to be at the very top of the oven having moved the standard oven racks out of the way. They need to cook for about 25 minutes, but after about 12 minutes I take them out quickly and put them back the other way to avoid the furthest in loaf getting incinerated. Cool on a wire rack and they are best eaten when still crispy. This entry was posted in Bread and pasta and tagged baguettes, home baking on October 30, 2015 by julianrawcliffe.